You will see plenty of 2018 NFL mock drafts and big boards with Bradley Chubb at the top, but he’s not the only elite EDGE rusher in this year’s class. 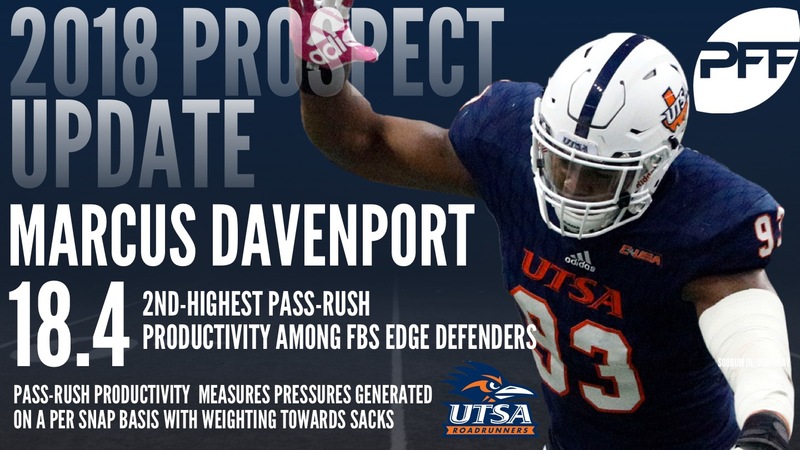 Marcus Davenport out of the University of Texas at San Antonio, is a guy with excellent size and length (6’6” 260) that used with his speed, snap anticipation and power makes him a problem off the edge. He has the versatility to be able to play with his hand in the dirt or in a two point stance that means he can play as a 4-3 defensive end or a 3-4 outside linebacker. He is still raw as a pass rusher as needs to be more consistent with his pass rush moves but has shown the ability to add moves to his arsenal that is shown in his productivity that exceeded expectations. His productivity as a EDGE rusher is shown here, via Pro Football Focus. He has also been very productive against the run. Even though he played two less games in 2016 he was able to improve on his 10 tackles for loss and increase that number to 17.5 in 2017 according to sports-reference.com. Here you’ll see his ability to burst off the edge with speed that he uses in combination with his power and length to drive the offensive tackle back into the quarterback and disrupt the pass. Length is something Davenport could look to use more frequently in his pass rush to outmatch opposing offensive tackles. At times his “Long Arm” move can be simply devastating. You’ll see he has developed the classic “Stab Club and Rip” move which he sets up after using the “long arm” bull rush to throw off his opposition. A big component in run defense is having proper leverage in order to gain the upper hand on the guy trying to block you. In this play, you’ll see Davenport take on the double team, extend his arms and then stalemate the block and fill his gap. You can tell five minutes into watching Marcus Davenport play that he has a high football IQ. During this play you can see him squeeze down the line taking away the cutback lane, closing on the running back and making the tackle. Here he shows some of his versatility to play in schemes where he will be asked to be in a two point stance and play in coverage. Notice his ability to get into the running back’s hip and run with him down the sideline. Impressive stuff. This is a very rare ability you’ll see from a primary rush defender. He drops into the hook/flat zone but he doesn’t keep his eyes at the quarterback. He turns his head and gets to the spot (the numbers) and then breaks back towards the field looking for work. Davenport has the athleticism and coverage ability to play as a rush linebacker and he has the size and strength to play in a 40 front. He excels when he uses his leverage to outmatch his opponents but he also has the football IQ to go with his athleticism to make him a high level EDGE defender. While he still needs to be more consistent with his pass rush moves and hand usage that is however part of the tremendous upside. If he is able to tie it all together he has the potential to have 10+ sacks on a yearly basis. He is definitely someone you want to keep your eye on in Mobile because I think he’ll be flying up mock drafts and big boards by the end of the week.